The entrance to Horezu Monastery. From Hunedoara and Corvin Castle we drove southeast to Horezu (via Târgu Jiu and an incredibly narrow mountain river gorge). Horezu, in the region of Wallachia, Romania is home to Horezu Monastery, a UNESCO World Heritage Site. The monastery is located just a few kilometers outside the village of Horezu–known for its brown pottery. Horezu Monastery is about 136 miles northwest of Bucharest. The monastery was founded in 1690, during the reign of Constantin Brâncoveanu (1654-1714). Brâncoveanu brought about a cultural renaissance to Wallachia. He met an unfortunate end to his life by being arrested, tortured and executed in Constantinople (Istanbul) in 1714, along with his four sons. He and his sons were declared saints and martyrs of the Romanian Orthodox Church in 1992. His work at Horezu gave him immortality by becoming the center and most famous example of an architectural style he established, now known as Brâncovenesc, which combines Western (Venetian) and Oriental (Ottoman) influences. View of the Great Church, with its ten-pillared porchway. A Brancoveanu porch with a stone balustrade carved with animal motifs. In the 17th and 18thcenturies, the Horezu monastery was a prestigious fresco-painting school. In the Great Church one can see why. This Church, dedicated to the Roman Emperor Constantine and his mother, Helena, contains outstanding frescoes which are original from 1694, although they were blackened by the smoke of fires of Turkish slaves who camped here (and thankfully now restored). 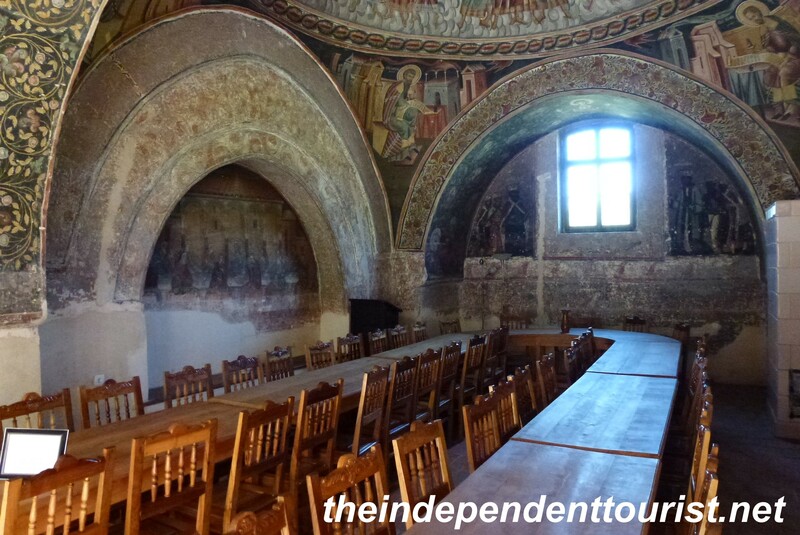 I loved the frescoes in the main chapel and also in the refectory. There is no entry fee to the monastery. Interior of the Great Church. The frescoes inside the Refectory. In the summer, the monastery opens 20 rooms for guests, so if you’ve ever wanted to live the life of monk, this is your chance. Keep in mind no food is served, so bring your own or be prepared to go back into town. A building with interesting construction techniques just outside the monastery–note the walls. The little town of Horezu had an interesting church with great frescoes. A little church in the village of Horezu–also beautifully decorated inside and out with frescoes. The ceiling of the porch in the little church in Horezu village. We stayed in a lovely pension in Horezu, called Pension Criveanu. Our pension in Horezu, Romania. Posted in Romania and tagged Horezu Monastery, Romania Travel, Wallachia Romania on August 20, 2012 by Paul Terry.